We at PhoneArena wish you, our readers, a very Merry Christmas! 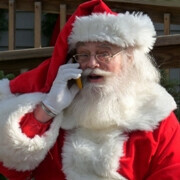 If you happen to get a new cell phone as a Christmas present, please let us know in the comment section below. i got a new galaxy nexus for the first night of Hanukkah! absolutely LOVE it! The 2 people that disliked this are rasict... GO JEWS! I got a tablet instead. Its an archos brand tablet. I had one and took it back not because I didn't like it but because it really didn't fit in with my MBP and iPod touch. My tablet didn't get much use so i returned it. :-) Merry Christmas! Just got my White 16GB iPhone 4S on Sprint... love it so far but waiting to activate at the Sprint store rather than online so I can transfer contacts, pictures, etc. Food and liquor = one of the greatest albums of all time MERRY CHRISTMAS! Same here too lol. Me and @ghost__uwi are accepting all donations. Merry christmas to all the christians and Muslims. Why not Merry Christmas to all? MERRY CHRISTMAS EVERYONE !!!! Got a Blackberry Porsche edition.................lol naat! Well, since in Acts it says it is better to give than recieve, I am not getting a new phone, but my two teenagers are- My college bound Daughter gets a Samsung Captivate Glide, and my Son gets his dream device of the Sony Erikson Play. To all: Merry Christmas to those who celebrate, my best wishes to all who don't, and God Bless everyone, regardless of faith or belief. You know, you perhaps post the wisest, unbiased and most thought-out posts from anyone on this website. I have been called tons of things, but never wise!! I truly thank-you for the good words, HTC. But trust me, had you read some of the posts I wrote when I first got on here, you would know how much I owe the other people on this site. Merry Christmas and a Happy New Year to you, snowgator! HTC has observed correctly, and spoken truth... among the many here, you are indeed among my favorites. Snowgator the Wise and Snowgator the Unbiased are both good titles by which you could be known here... Where you have come from is certainly important to the past experiences which inform you, but where you have ended up is much more important... we all do some intellectual growing now and then. I also greatly appreciate the sentiment you have shared in this chain of posts. Thank you for sharing! Merry Christmas to every reader, all the contributors here who comment (I always read your comments and learn). Merry Christmas to PA team. Though I do not agree some times with you for the the stuff you provide but thank you for being there with all the updates and knowledge you share. Merry Christmas to all the fan boys (we fight some times like enemies but the fact is we always like to share our liking/disliking and without fan boys there will be no fun :). Best wishes for everyone. It is good to hear from you Raza. I like your sentiment here, and Merry Christmas to you (and a Happy New Year)! We may not always agree with PA on things, or with each other, but where would we be without you all? Thank you to all, and enjoy the season! Merry Christmas, no matter whether it's of religious significance to you. And also no matter whether the iPhone star app is used for the top of your tree. :) It's really been a trip of a year, hasn't it?